Do you enjoy having pampering facials? How often do you visit your beauty salon? Well, certainly slapping an extra potion of luxurious moisturizing products on your face under skilful hands does no harm, doesn't it? I have been visiting Immortelle Atelier for some months now, and I love how my beautician transports me to a world of total relaxation to recharge myself. I have explored some of their luxe facial treatments and with each visit, my skin is revitalized and toned with high-performance ingredients from Maria Galland Paris and Jyunka. This visit to Immortelle Atelier, I had the Maria Galland Luxe Facial for the second time. Only difference was that I had the collagen mask previously, and my therapist put on the whitening mask this time round. 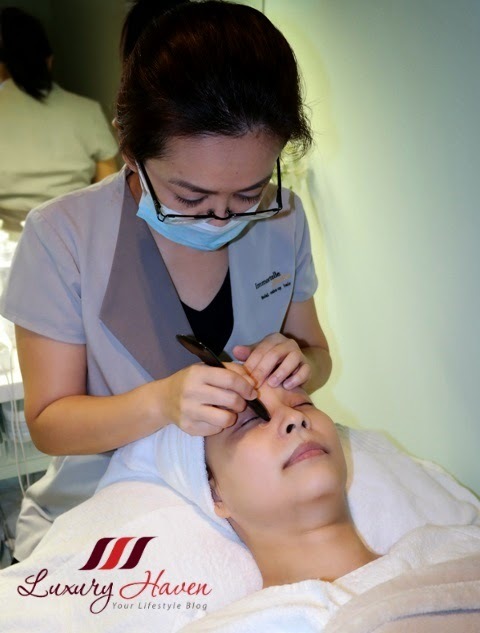 Using the most superior products from MariaGalland, the treatment contributes significantly to reduce wrinkles, regenerate and firm the skin. Suitable for those with dark circles, tired and stressed eyes. Let Jyunka's range of products transforms your skin and let it glow almost immediately. Perfect for those with tired and dull skin! The #Cryolift utilizes state-of-the-art non-surgical technology to treat signs of ageing through Cryotherapy or “freeze therapy”. Suitable for those who wish to turn back to clock on their face and body. MoroccanOil Hair & Scalp Treatment and Maria Galland Cocoon Hand Mask! While the Moroccanoil® Hair and Scalp Treatment gives you brilliantly shiny and manageable hair plus a cleaner scalp, the Maria Galland Cocoon Hand Mask is a soft foam mask which envelops the hand like a cocoon giving you soft and silky hands. 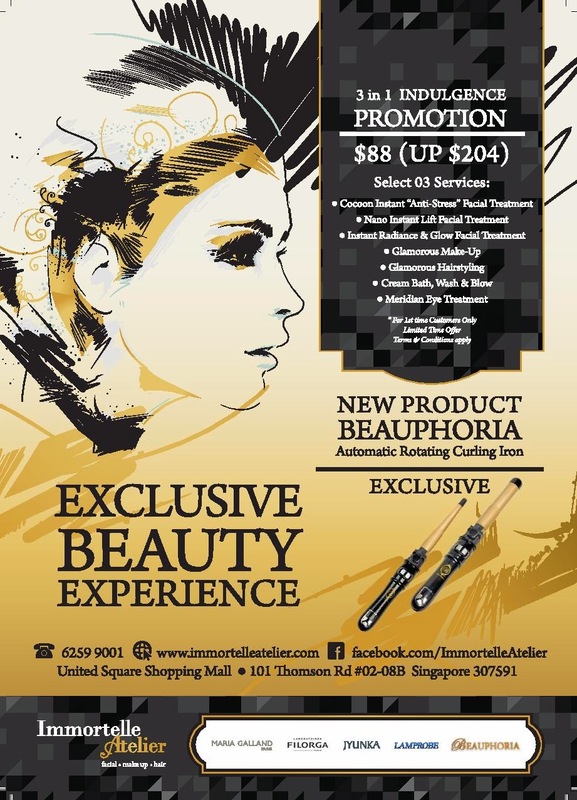 Be sure to check out their pretty styling tool gadgets such as the Beauphoria Carousel Curler when you are at Immortelle Atelier! Those looking for a relaxing and rejuvenating spa experience as well as makeover session all rolled into one, can look forward to pampering their skin and getting a top-to-toe makeover with our 3 in 1 Indulgence treatment – the ultimate indulgence for the senses! I do enjoy getting pamper never no time. This place does an amazing job. Who would ever say no to such beauty treatments. No me for sure. Your glowing skin speaks loudly about why its important to maintain it. Lovely treatments, I need to visit this place!!!! wow, they really seem like great treatments because your skin looks fantastic! getting pampered by skilled hands...that's always delightful! Looks like a great day of pampering. Oh how you make me want to have a treatment like this!! Must be gorgeous!! I have not been to a beauty salon forerver. I only ever had one facial and i found it painful- althugh looking at your expereince I might reconsider. I know and i love this brand it's so good! Wow! This really looks very convenient to get yourself pamper from head to toe. Can definitely spend a day there - totally worth it. love the pampering session! its about time for me to get one session like this. You look so beautiful, I'm green with envy. Have a wonderful week! Wow your skin looks so smooth haha. And I know I'm a guy but I really wanna try a beauty salon someday. I know there are salons for guys out there. I have to find them. lol. Oh I wanna get pampered like you, Shirley.........you skin almost glow. Beautiful. Shirley, your face is absolutely luminous and line free!! Line free?? I wish, Trishie! Hahaha! I love your skin! And this facial sounds interesting. Wow your skin looks amazing! Your skin is glowing! I haven't been pampered in a while now. I think I need to make an appointment! Your skin looks stunning, way to go.